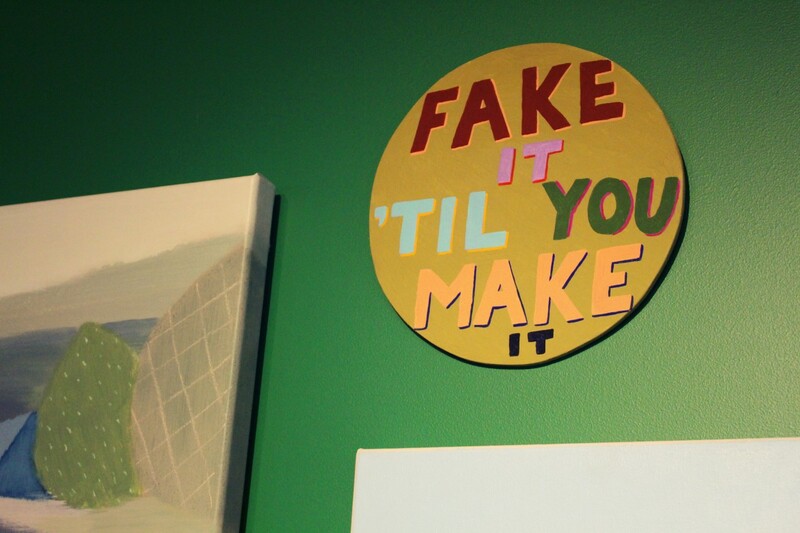 I was just talking to someone, and the phrase “Fake it ’til you make it” came up. This is simultaneously the most useful and the most damaging piece of advice in the world. It is both one of the few things you need to understand to be successful at anything and a potent formula for self-alienation and collapse. The thing that I think is potently, powerfully good about “fake it ’til you make it” is that it encourages you to just act. It knows that it is action — even if directed by a sense that you’re just “going through the motions” or “play-acting” — that really moves things forward. The phrase is a reminder that you can’t just sit there and think about how you’d be a good father, sister, friend, coworker, or whatever. You’ve got to actually go out in the world and do those wise things. What’s more, experience has shown me that you can fake some things into being true. For me, smiling — when I’m in the right mood — can actually make me feel happier. And going through the motions of starting a workout can end with me very glad that I did. The same happens to me a lot around social occasions — I have to cajole myself into going, and then I have a great time. Faking it is great because it trades on this wisdom and experience that doing things makes things change. And that sometimes just trying to do a thing is enough to make it actually become true. You can fake your way into being a better friend or life-partner or whatever just by continuing to go through the motions that you know a better friend or life-partner would. So faking it can lead to action, mood-change, and wise actions. Good things, right? What’s bad is that if you “fake it” too hard and too long, but it never changes — you just keep feeling like you’re play-acting your life — it can feel so devastating. Like you’re a failure and a fraud and, by the way, no one has ever really loved you. “Fake it ’til you make it” can be read to encourage unhealthy levels of self-deception. And self-deception is a great recipe for self-alienation, which is itself a giant black hole. A hole which can lead you into some very dark, brutal, hard feelings. When you accept yourself as you are, you love yourself. When you love yourself, you remain in touch with those traits that make you worthy, lovable, and interesting to the world. When you’re faking it, you’re forced to (at least a little bit) reject the part of yourself that feels that you’re faking it. And that level of self-rejection can easily lead you to violent full-throated self-hatred. You’ve got to keep aware of both halves of this dichotomy. You’re best served by staying aware that faking it is great advice when you don’t know how to act in a given situation: pretend that you’re the perfect person for that situation and then do what you envision them doing. But you must always realize that what you’re doing is an abnormal stretch, a risk, and something that hasn’t touched the core truth of who you are: a lovable, worthy, intelligent, and adaptable person doing the best they can in a world where they sometimes feel out of place.